On February 9, 2011 February 10, 2011 By AngeliaIn Life is what you make it. I get the word of the day on my phone. I like to see new words, and normally, I don’t have time to look right then. I might go back and have a look, if I am really curious. So, when I saw this word of the day back in January? Sounds like a pretty good concert in Germany. Am I the only one that says it with an Arnold accent? Anyway, I like getting the word of the day. It makes me feel smart. It makes me feel accomplished. It makes me feel like I could possibly learn something, even if don’t. Because that would mean reading the definitions and/or using it in a sentence (maybe in that same month?). Ahem. But katzenjammer intrigued me. I saved it and had to look it up tonight. What did it mean? And who in the world (besides Germany) would use it in a their normal language – not that there is anything wrong with using katzenjammer in every day language in America. What secret does katzenjammer hold? What mysteries of the language will it reveal? Admit it, you like saying that. 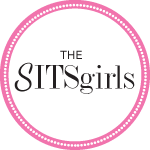 Does it make you giggle too? If it’s not a concert in Germany, then could it possibly be a yacht sailing around the world? I can smell the coconut oil, and sea breeze. Feel the warm sun as it sinks on the horizon of blue [pan close-up of umbrella drink]. You might be surprised to know the definition. It is not a German concert. Nor, a yacht sailing the tropics. Does that change the word for you too? It’s no longer exotic, or foreign. It’s Ralph talking on the big white phone. 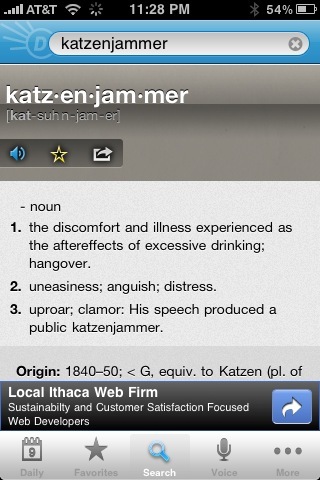 Katzenjammer, I will never drink again. Katzenjammer, I need a big greasy burger. Katzenjammer, pass the ice pack and two Tylenol, wake me when I can stand on two feet. I had some katzenjammer times myself. Sooooo glad those days are over. Thank-you word of the day, I remember why I love a glass of wine. ONE glass of wine. I wouldn’t want to have any katzenjammer hair of the dog. I feel much better now, don’t you? Now, I challenge you to use the “word of the day” in every day normal conversation….not necessarily katzenjammer, but the ones that pop up on your phone…..
Missy- One didn’t pop up today pinky swear! Unless, my doppleganger got it! 😉 Haha. Have a great Thursday, the weekend’s just around the corner! That word is too long to even remember when you’re hungover!! Kimberly, Um…yes? I think it would cause a might katzenjammer to remember that. HA. Now I’m intrigued because my mom used to talk about an old comic strip called the Katzenjammer Kids. I’ll have to go look it up and see what it was about! Motpg- That’s funny! Someone else said that too. I guess they are using the last meaning of the word which I actively did at work the other day – by accident. What a katzenjammer! I have never heard this word used, anywhere! What a revelation! Why don’t people use it every day?? Hmmm, maybe not then. I can imagine my friends reaction if I say to them ‘bet that gave you a real katzenjammer, didn’t it!’. Mandy, they would definitely think you were showing off! HA! Yep…definitely said it with the Arnold accent. 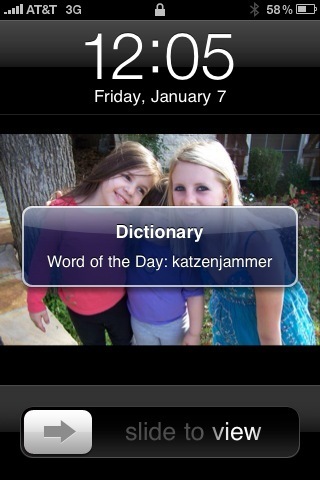 I now want to go around school and just scream “KATZENJAMMER!” in people’s faces. Aunt Bethany, that would cause quite the KATZENJAMMER!! HA HA. When I was a kid, there was actually a syndicated cartoon strip called “The Katzenjammer Kids” about two very rebellious children. Learn something new every day! I have to admit, that’s a word I’d NEVER heard of before in my life. Foxy- It’s a really fun word. See what you were missing? LOL!! Soo not what I was expecting! I too spent too many nights in my youth experiencing the joy of Katzenjammer. Tom G – yet, another word that makes me laugh. It’s the Hemo Goblin! HA. I have this on my phone too and I rarely look at it. When I pick up my phone it is to DO something on it, so I just “close”. Then when I go into my dictionary program I am doing so to look something up not read the word of the day. But do I turn it off, no. Because every once in a while I do look. I missed this one. Terre- It’s a very handy app! Karen- I soooooo agree! Relaxing and sipping slowly. Ahh! That makes me REALLY think about that guy who did that comic strip Katzenajammer KIDS? What kind of drunken kid was he?